I love beans! I love all kinds of beans cooked just about any way. I love them steamed, sauteed, baked, fried and refried. Here is a quick recipe for the latter. These are refried beans taken to, dare I say it, another level. I generally hate that expression, but I couldn't resist. Sorry. I normally try to say something more about the recipe at this point, but I'll be honest and say that I don't know what else to say. They are beans and they are good. There. That's all I've got. Heat the oil in a medium sauce pan. 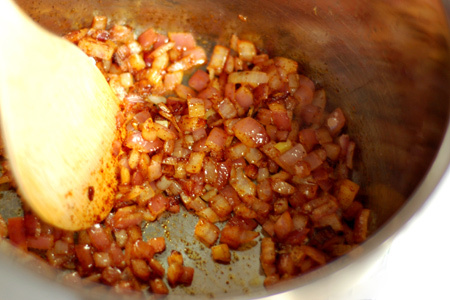 Add the chile powder and saute until the onions just start to brown. Add the Rotel and bring just to a simmer. Add the beans and water then bring it back to a simmer. Simmer covered for 30 minutes, stirring occasionally. Mash the beans with a potato masher. 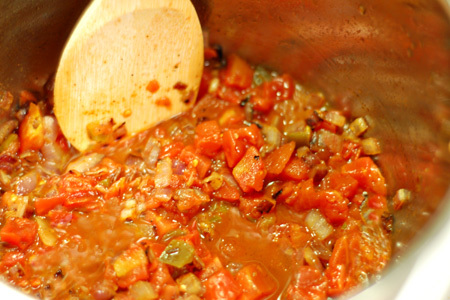 Adjust the consistency as needed by cooking uncovered or adding water. 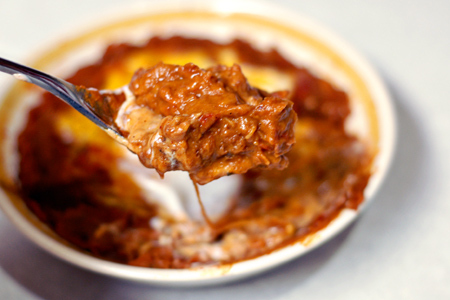 Serve topped with a little grated cheddar or Colby-jack cheese and some sour cream (optional, but highly recommended). It is one of the greater travesties that I cannot get Ranch Style Beans up here in Erie, PA - I was raised on them! Thanks, Rikki. I was born and partially raised just to the west of you in Ashtabula. I remember many treks to the mall in Erie. FYI - You can get the beans online. The Con-Agra website shows the beans are available at the Sav-A-Lot in Erie. These look terrific- and could be a whole meal with the cheese and a salad. Luckily I can get ranch style beans though I have never tried them. Ashtabula? I live here! How unusual. I clicked on your recipe from TasteSpotting and I find a foodie blogger from my small semi-defunct town.It's a small world. I am also curious about these Ranch beans, what makes them so special? What type of beans are they? I am intrigued. I am going to check my local Save-A-Lot, but I would imagine that in Erie they would/should have them at Wegman's. The hunt for Ranch beans is ON! And now you have a follower due to beans and Ashtabula. I can't get over it! 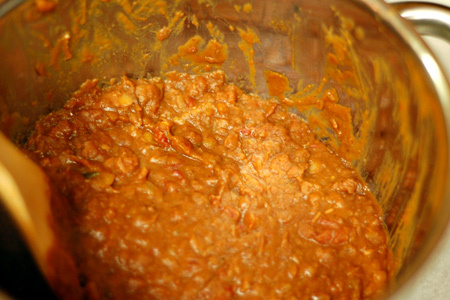 I love making and eating refried beans. I love how cheesy your beans look! Goodness! 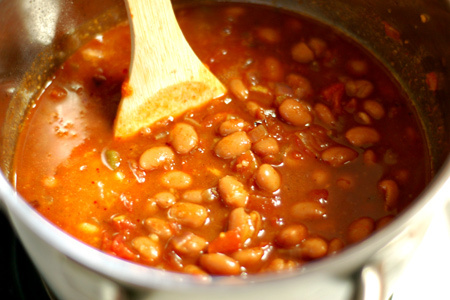 I usually make mine from raw beans but i will try this out when I want a quicker version! Great photos! I'm making these tomorrow night! They look sooo yummy. I made these beans alongside a dish of Beef Enchilladas and they went over very well! Quick and inexpensive to make. I went ahead and stirred in a dallop of sour cream and a handful of cheese to the pot before serving. Thanks for the great recipe! 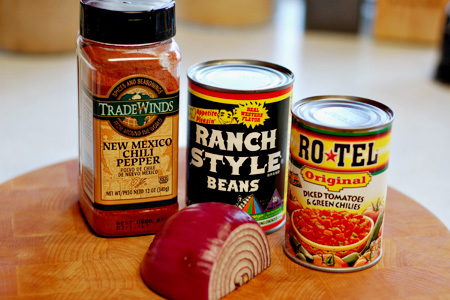 We absolutely LOVE Ranch style beans and used to eat them all the time but I don't see them in stores much anymore. They were my favorite and there really isn't any other type out there like them that I've found. Be sure to check the organic canned food section for Ranch style beans. For some reason that is the only place I can find them in Columbus OHio. Made these last night and they were great. Because in Michigan we do not have Ranch beans I used pinto beans. I hope pinto beans are close to Ranch beans. I made your chuckie beef and made sandwiches and topped with the funky refried beans. FABULOUS. Anonymous - Excellent! I'm really glad that both recipes worked for you.